Why should you choose a bluetooth card terminal? Make payment easy for your customers with our bluetooth terminals. For businesses such as restaurants and open plan stores, it can be more convenient for your customers to pay at their table or on the shop floor. 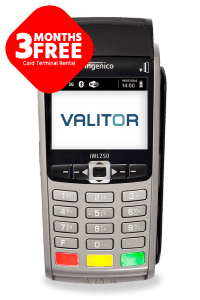 Portable, bluetooth credit card machines are the ideal way to accept payments from anywhere in your place of business, even if you don’t have a Wi-Fi connection. These terminals are just as fast and reliable as countertop machines, but give the added flexibility of offering your customers a ‘pay-at-table’ service, which makes buying and selling a quicker and easier experience. All terminals arrive pre-configured by our in-house team. We set up all bluetooth terminals at our warehouse and provide all the guides and step-by-step support you need to set up. We also can provide a range of accessories, such as till rolls and a docking stations to charge your terminals. Even if you are new to the technology, we can make it easy for you.